Bay - Rare Flaire stands 15:3 and is an excellent example of Morgan type. He has won In Hand, Park Harness, Pleasure Driving and Park Saddle. 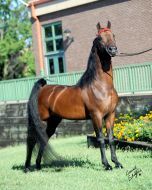 He has sired National Champions: Mantic Top Gun, HyLee’s Diamond Flaire. 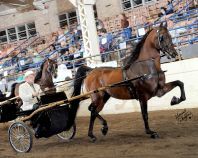 Other show ring champions are: HyLee’s Majorette, HyLee’s Celtic Flaire, Dreammaster Flairity, HyLee’s Red Fox, HyLee’s Boda Bing Boda Boom, HyLee’s Thunder Comin’, HyLee’s Pizzerinktum, to mention a few. 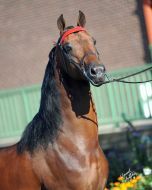 He is a sire that gives animated motion, strong hocks, good size and depth of body, trainability, good bone and feet, and a ton of attitude. The Biggest Bang has been growing up the past two years and made his debut under saddle in the New York Breeders Futurity in September. He was 5th his first time out. He shows great promise in his division. 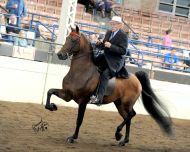 He was in training his 3 and 4 year old year with Mike Scanlon and shown by "D" in New York his first time out. He has great presence, very upheaded and is very smooth. He will still be in the development stages his 5 year old year. It is planned to show him pleasure driving this coming season. He will stand his first season in 2010. 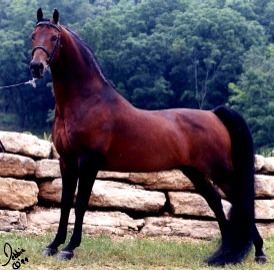 As a yearling and two-year old he won many in-hand and sweepstakes events. 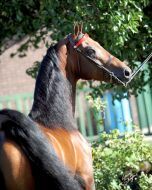 He has Born To Boggie's head and set and shows his mother's sire, Serenity Flight Time, cadence and body type.